Poll: Which teams emerge from the Second Round? After an interesting if not exactly Kings-Blackhawks Game 7-type showing between the Lightning and Red Wings resulted in Tampa Bay’s advancement last night, the Second Round of the Stanley Cup Playoffs begin tonight at the Honda Center, where the Ducks host the Flames, and Madison Square Garden, where the Rangers host the Capitals. Before we get to the polls and schedule, here’s a retraction: my bracket might not be wrong, after all. Have your rooting allegiances evolved after the first round? Which player has been the biggest surprise through the first two weeks of the playoffs? Can Calgary win its first game in Anaheim since Darryl Sutter was the coach? Will Montreal win a series against a team it lost all five games to in the regular season? Is a Cinderella Minnesota run in store? Should the Wild even be referred to as a “Cinderella” team? I’ll take your answers off the air. 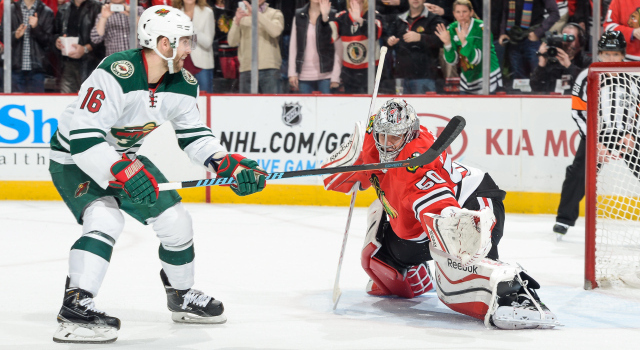 Who wins the Blackhawks-Wild series? Who wins the Ducks-Flames series? Who wins the Canadiens-Lightning series? Who wins the Rangers-Capitals series?